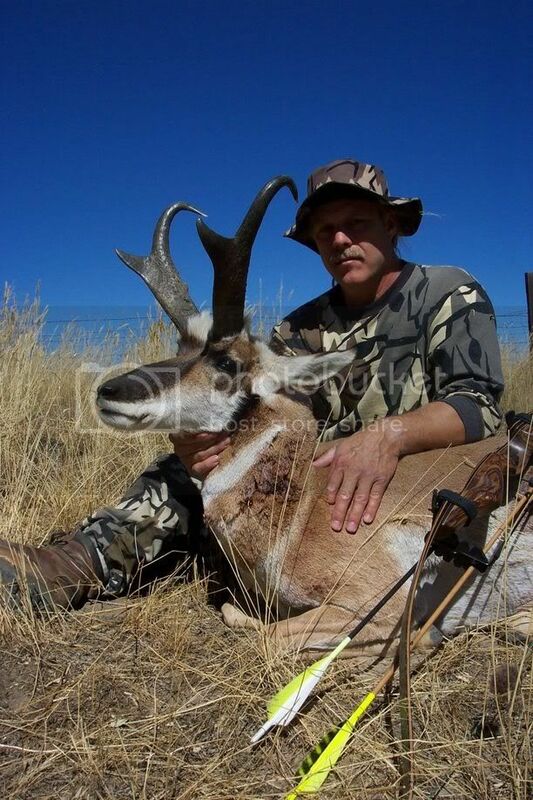 Here is an antelope I shot 9/20 on the Smith Sheep Ranch. This was my first "lope " hunt and I guess I had some beginer's luck. The shot was about 10 yrds. and I was using a Morrison Shawnee with Arapaho limbs,Goldtip arrows tipped with WW heads. What made the trip even more memorable was being able to share camp with fellow Tradgangers Dave Tice (Tique) and Scott Frost (Southpawshooter). NO matter where you go there you are ! Bill, That's a excellent picture. I really like a close up picture. I don't know much about antelope but he sure looks like a good 'un to me. That's a beauty!!!!! Nice pic too! Big Pope and Younger!!! Way to go! Just saw this thread - missed the 'lope in camp. That is one fine animal my friend!!!!!!!! Guess them 3 blades work just fine !!!! Sure was great sharing camp with you and Tique. Hope to see ya' again soon.